Demand for advanced ceramics in the US is forecast to increase 5.1 percent annually to $13.6 billion in 2017. Medical products will be the fastest growing market, driven by applications such as dental implants and prosthetic components. Ceramic matrix composites will be the fastest growing class of products. 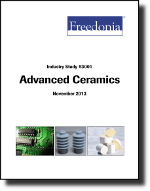 This study analyzes the $10.6 billion US advanced ceramics industry. It presents historical demand data for 2002, 2007 and 2012, and forecasts for 2017 and 2022 by material (e.g., alumina ceramics, titanate ceramics, zirconate ceramics, cordierite ceramics), class (monolithic ceramics, ceramic coatings, ceramic matrix composites), product (e.g., electrical and electronic parts, catalyst support, wear parts, engine parts, filters, bioceramics, armor) and market (e.g., electronic components, transportation equipment, electrical equipment, chemical, machinery, environmental).